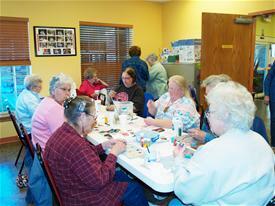 The Crafty Seniors meet weekly in the craft room directly off of the Title VI dining room. Members do bead work, make shawls and many more beautiful handmade items. These items are for sale in the dining room. Get up to date information about Crafty Seniors events and doings by subscribing to the Crafty Seniors List Serve. Simply click on Notify Me, register your email address and click on the email icon next to the Crafty Seniors listing. You will then get a notice when something new has been posted to the Crafty Seniors page. You can also get a text message if you register your cell phone number. Join those in the know! Periodically the Crafty Seniors display and sell the beautiful items that they create at events.